What is Graduate Training? Not to be confused with Graduate Medical Education (GME) for physicians, the Graduate Training Office develops and directs various graduate degree programs affiliated with the University of Arizona College Of Medicine – Phoenix. The office also provides assistance with planning and learning skills, as well as professional and career development for pre- and postdoctoral trainees. 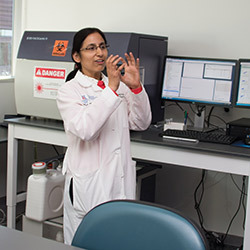 PhD students in College of Medicine – Phoenix graduate programs work in laboratories or clinics as Research Interns. Clinical Translational Sciences (CTS) Graduate Program. Interdisciplinary Graduate Program in Neuroscience. College of Medicine – Phoenix MD/PhD Dual Degree. Precision Medicine MS Program, planned for 2019. Clinical Research, Design and Analysis Graduate Program, planned for 2019. In its Professional Development series, the Graduate Training Office offers an annual course on Responsible Conduct of Research (RCR) (PDF), as well as workshops on resume/CV building, applying for jobs, interview skills, lab, personnel management, etc. Students can obtain credit for attending the RCR series by enrolling in Clinical and Translational Sciences 595C in Fall or Spring semesters. Certification is available for completing the RCR curriculum, which can be used to support extramural funding applications. The Graduate Training Office can assist students in finding committees, societies or organizations that pertain to their field of study. 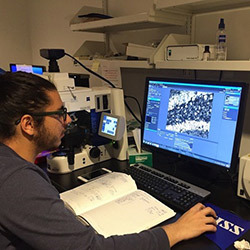 The Graduate Training Office also offers annual competitions for Graduate Student Travel Awards to help them attend scientific conferences to present their research results. All College of Medicine – Phoenix graduate students are welcome to utilize the resources and participate in workshops offered by the University of Arizona Graduate Center. For more information, please check the Graduate Center's Calendar of Activities, or sign up for their mailing list. The Graduate Training Office supports the use of Individual Development Plans (IDPs) for pre- and postdoctoral trainees in our graduate programs. The annual IDP helps you and your mentor define your progress, consider gaps in skills or knowledge and formulate plans for the coming year. The Graduate Training Office, in association with the College of Medicine – Phoenix Research Office and the Office of Faculty Affairs, offers periodic training sessions in grant writing, academic writing and biostatistics, to name a few. If there is a skill that needs improvement, the office may have a training session; contact the office for more details.